derived from Arabians (June 1984) by Suzi Morris. Enhanced with information and photos from various other sources. The splashy chestnut *Crabbet (Rijm x *Narda II by Rejeb) was a yearling when he was imported to the United States from England in 1910 by F. Lothrop Ames of Boston, Massachusetts. 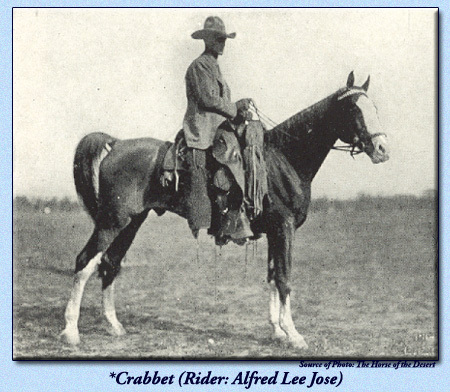 Although *Crabbet was gelded after his arrival, he had a permanent impact on the Arabian breed here as one of the all-time great endurance horses. *Crabbet, who had a bald face, high white on all four legs and a large white patch on his belly, was nine years old when his endurance training began. In 1918, he was entered in a private contest held by W.R. Brown and several other horse breeders which required the mounts to carry 200 pounds for 162 miles. *Crabbet, who was recovering from an illness at the time, was withdrawn after 100 miles, a distance he completed in 17 hours, 12 minutes. 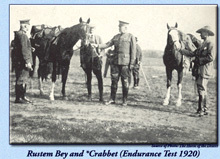 After his endurance ride debut, *Crabbet went on to complete and finish in four of the U.S. Cavalry Endurance Tests (1919, 1920, 1921, and 1922). In these, he took honors three times. 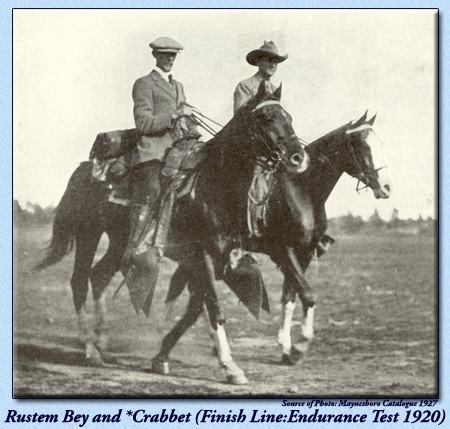 In the 1919 test, *Crabbet took fifth place, carrying 200 pounds over 306 miles in 53 hours, 56 minutes. This course covered ground from Fort Ethan Allen, Vermont, to Camp Devens, Massachusetts, and the distance was required to be covered at a rate of 60 miles per day for 5 days. There were 14 entries of various horse breeds. 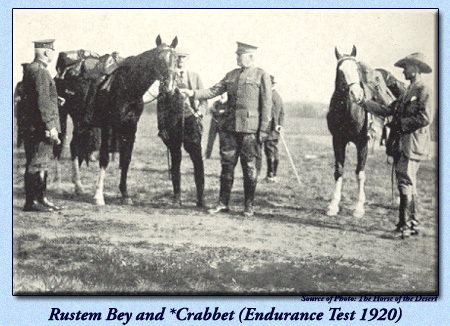 *Crabbet took fifth place again in the 1920 test which covered the same course. In this test, horses were required to carry 245 pounds, and there were 28 entries of all different breeds with a total of only 10 horses finishing. *Crabbet finished in 5th place in the time of 52 hours, 33 minutes ~ topping the time recorded the year before. His full sister *Noam also completed the ride successfully, and so did Rustem Bey who took second place. These three horses were all owned by W.R. Brown and represented his Maynesboro Stud of Berlin, New Hampshire. The gallant *Crabbet had come into his prime by the 1921 test. This race covered 310 miles. 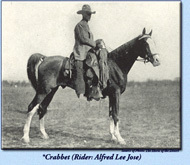 *Crabbet won it in the time of 49 hours, 4 minutes, again carrying 245 pounds. His performance was even more impressive as the following morning, only he and the Half-Arabian, Rustem Bey (Khaled x Midgie by Sentinel Wilkes), were able to gallop freely up and down the field. Out of the 17 entries, only 7 managed to complete the ride. Furthermore, much of this route (from Redbank, New Jersey to Washington, D.C.) was on paved roads. 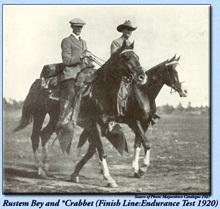 Although he did not place in the 1922 U.S. Army Endurance Test, *Crabbet continued to win other distance contests. His ability to excel in endurance tests did much to promote the Arabian breed among horsemen of the day. or the Sport of Endurance Racing, please contact us. Visitors are always welcome; appointments are appreciated. Copyright � 2003-2012. Website designed and maintained by Suzi Morris. All rights reserved. This page created for Arieana's Heritage Notebook July 10, 2005. Revised with new photos and enhanced information January 15, 2006. Updated and Current as of August 11, 2012.